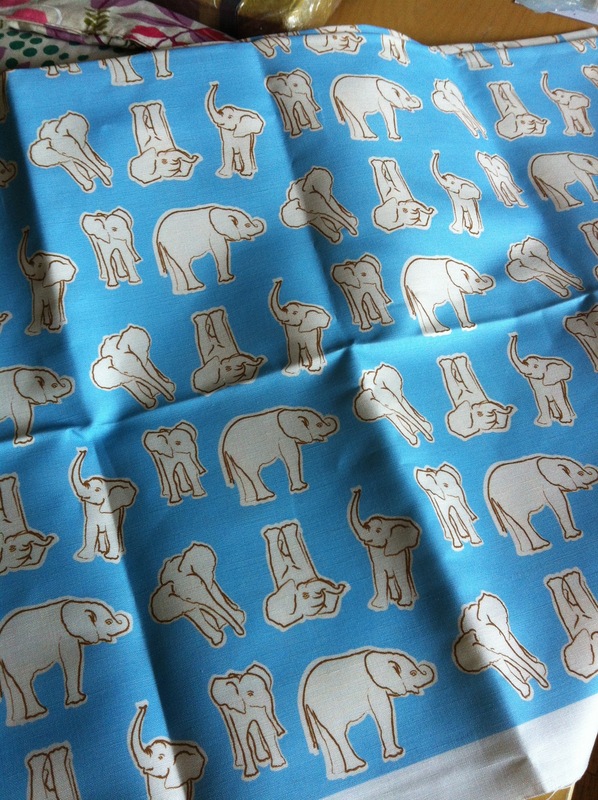 Just got on a yard of fabric from Spoonflower.com that I designed! Will be making the cruder bag in this for the updated cover for the Cruzers sewing pattern! Yeay! 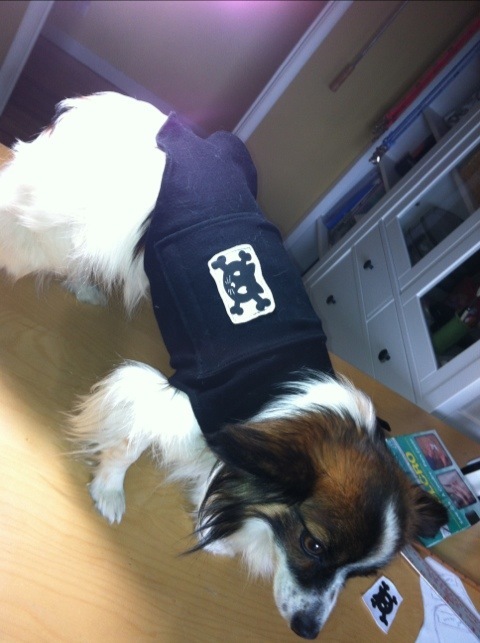 Here is Finn modeling my version of the Thundershirt. I made this for a recently rescued papillon who has separation anxiety issues. Her foster parents are bringing her over tomorrow. She will be hanging out with me and my crew for the weekend! These are pretty easy to make! Just 4 pieces of fabric for the front and backside and straight jacket strap which is made up of the other two fabric pieces. Lot’s of Velcro all around for the secure fit. Here it is all flat out! I used a nice 4 way stretch Jersey fabric I had laying around. Measure your dogs belly, neck and base of neck to base of tail. Add 6″ to the belly measurements so it can wrap your dog. As you can see just one shaped body piece made of 2 pieces of fabric sewn together and then turned right side out. Then top stitched all around. Velcro for the neck area (which is the “V” like portion at the top of the photo). The LEFT SIDE of the “V” has one long piece of the soft Velcro on the TOP SIDE. The RIGHT SIDE of the “V” has the rough Velcro on the UNDERSIDE of it. The long portion on the right has 2 long strips of the soft Velcro sewn on the TOP SIDE. The UNDERSIDE has 3 short strips (perpendicular to the top pieces) of the rough Velcro. 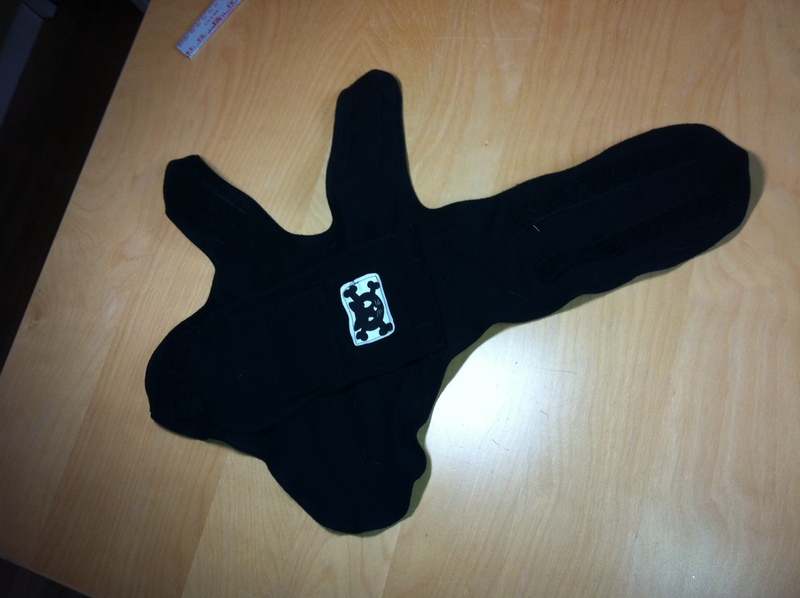 The left end on the TOP SIDE has 2 wide pieces of the soft Velcro. And that’s it for Velcro on the body panel! Use a wide Velcro and then cut to strips for areas that it’s too large for. And of course I added the final touch of the kitty crossbones on top of the flap! 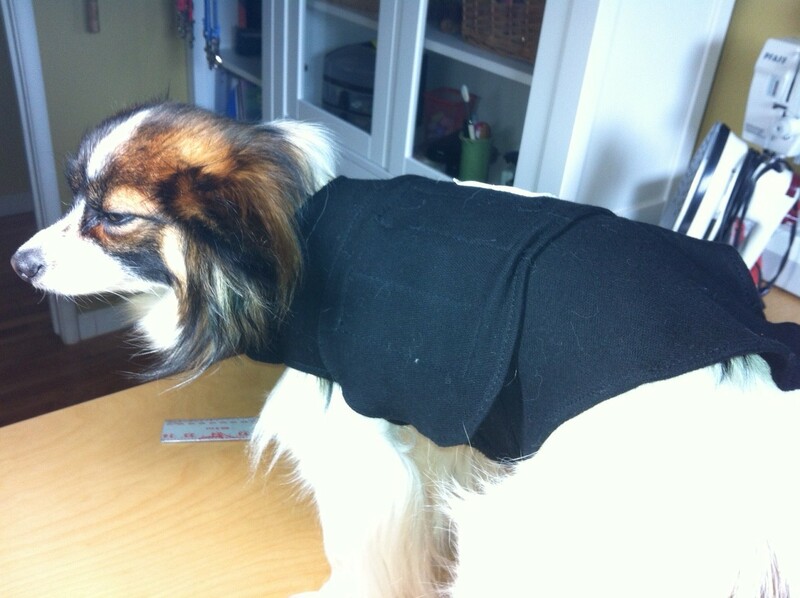 You want it to be snug around your dog’s middle. This is what makes your dog calm. That light squeezing on his or her torso! 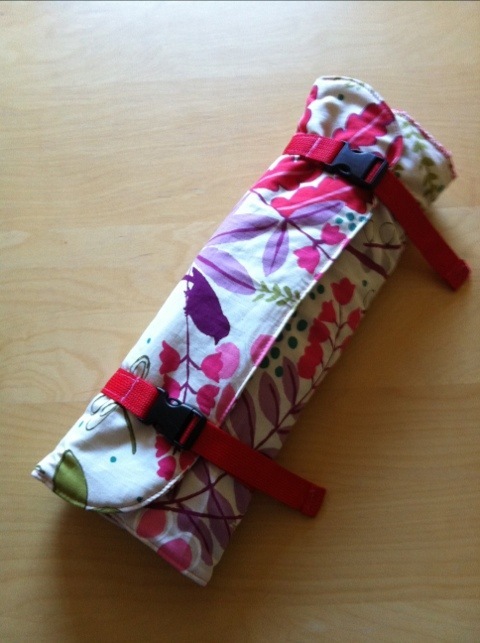 Chef Knife Roll Sewing Pattern is up! Whew!!! It’s ready to purchase! This Chef Knife Roll is now available on my ETSY page as well will be available on Fairytales, Frocks and Lollipops site too! 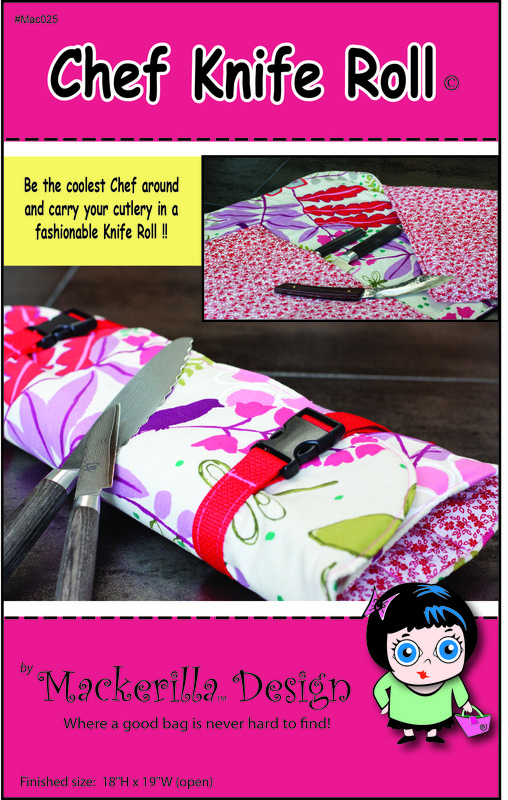 Be the envy of your foodie friends and culinary colleagues by toting around your cutlery in this baby!! 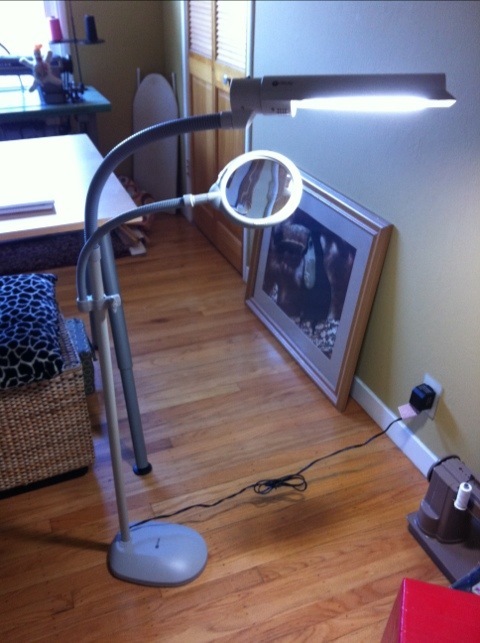 I ordered an Ott lite craft lamp with attached magnifying glass! It’s very nice and sturdy. These can be pricey but I found this one on Amazon.com. These sell for over $150 and I got this one for $86 and change! Now to get some new projects started so I can use it! I have 4 vintage sewing machines. One is my industrial Singer, another a heavy-duty Pfaff 130, then there is a mint condition Singer 401A and lastly a sweet turquoise Fleetwood 195 Deluxe. All in great working order thankfully!!! I found the Website S.O.S. Machine which is in Los Gatos, California. So close enough for me to take my vintage machines too if needed. He does sell some of these old beauties too. They are dedicated in saving vintage machines that are in need of some TLC. Oh and I am going to sell the Singer 401A if anyone is interested!!! I am finding out what the worth is of it and the shipping costs at the moment!!! I just discovered a cool Gift Basket Website to buy all sorts of gift baskets filled with loads of fantastic goodies for all occasions!! The website I found is called Gourmet Gift Baskets. They do simply have the best ones! Super cute Easter Gift Baskets chocked full of peeps, goodies and a big fluffy bunny! From the traditional gift style basket with a classic bunny and candies to chocolate bunnies and wine! Check them out. It’s not too early to start thinking of Easter!